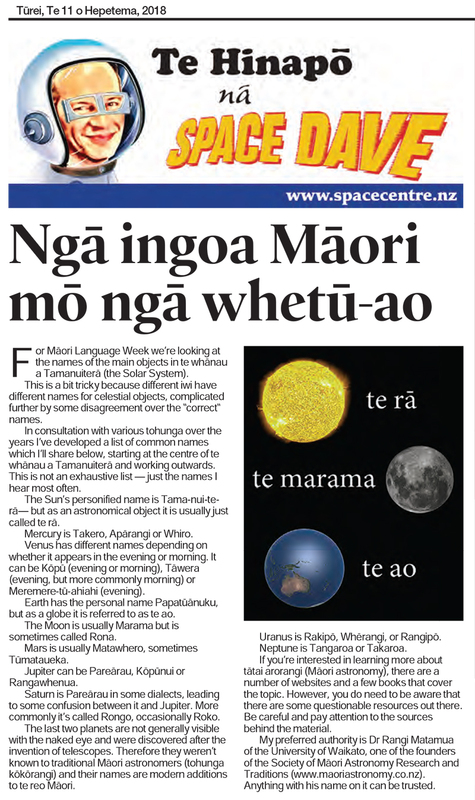 For Māori Language Week we're looking at the names of the main objects in te whānau a Tamanuiterā (the Solar System). This is a bit tricky because different iwi have different names for celestial objects, complicated further by some disagreement over the "correct" names. In consultation with various tohunga over the years I've developed a list of common names which I'll share below, starting at the centre of te whānau a Tamanuiterā and working outwards. This is not an exhaustive list — just the names I hear most often. The Sun's personified name is Tama-nui-te-rā but as an astronomical object it is usually just called te rā. Mercury is Takero, Apārangi, or Whiro. Venus has different names depending on whether it appears in the evening or morning. It can be Kōpū (evening or morning), Tāwera (evening but more commonly morning), or Meremere-tū-ahiahi (evening). Earth has the personal name Papatūānuku but as a globe it is referred to as te ao. The Moon is usually Marama but is sometimes called Rona. Mars is usually Matawhero, sometimes Tūmataueka. Jupiter can be Pareārau, Kōpūnui, or Rangawhenua. Saturn is Pareārau in some dialects, leading to some confusion between it and Jupiter. More commonly it's called Rongo, occasionaly Roko. The last two planets are not generally visible with the naked eye and were discovered after the invention of telescopes. Therefore they weren't known to traditional Māori astronomers (tohunga kōkōrangi) and their names are modern additions to te reo Māori. Uranus is Rakipō, Whērangi, or Rangipō. Neptune is Tangaroa or Takaroa. If you're interested in learning more about tātai arorangi (Māori astronomy), there are a number of websites and a few books that cover the topic. However you do need to be aware that there are some questionable resources out there. Be careful and pay attention to the sources behind the material. My preferred authority is Dr Rangi Matamua of the University of Waikato, one of the founders of the Society of Maori Astronomy Research and Traditions (www.maoriastronomy.co.nz). Anything with his name on it can be trusted.